3D Additive Manufacturing | Temco Tool Inc.
TEMCO Tool offers another value-added service by providing Direct Metal Laser Sintering (DMLS), utilizing the latest technology in rapid prototype and direct STLA digital file manufacturing services. TEMCO can provide metals piece parts and/or near net shape products from Aluminum, Stainless Steel, Inconel and Titanium alloys for applications ranging from engineering samples to production. 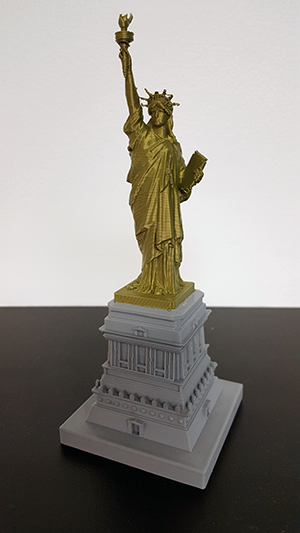 Alternative to metal printing utilizing PLA, ABS, PC and PETG filament materials. High quality piece parts and custom services, from one-piece prototype engineered part, to production lot sizes. Product print capacity maximum limits: 12" x 12" x 24". Utilizing the DMLS process, metals parts of the most complex geometries are built layer-by-layer, down to 20 microns (0.000787") directly from 3D CAD data files. Parts built from using DMLS have excellent mechanical properties equivalent to wrought materials, high detail resolution and exceptional surface quality. The metal powder is melted entirely to create a fully dense, fine homogeneous structure. DMLS allows for unique geometric freedom of design enables DMLS to form cavities and undercuts without requiring conventional machining methods. When a part needs to be tested and re-designed over and over, the lead-time for receiving a traditionally machined tooled part can create a lag-time in the final production process. DMLS produces parts that are fine quality and can be built in a matter of hours or days, rather than weeks. The ability to generate functional metal prototypes in short order, fundamentally impacts design processes, accelerating design cycles and time to market.